Echinacea is a genus of flowering plants in the Daisy family (Compositae). Commonly called purple coneflowers, there are nine different species of Echinacea with three of these species used for medicinal purposes: Echinacea purpurea, E. angustifolia, and E. pallida. Echinacea grows in the wild in the Rocky Mountains of the United States and is cultivated for use in dietary supplements. 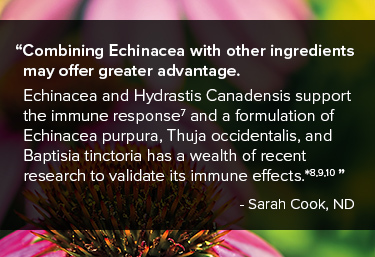 Isolated case reports have raised concerns about the potential for Echinacea to aggravate or activate the autoimmune response.18 The validity of these concerns has been challenged, however, because the alkylamides in Echinacea suppress the cellular immune response. *19 Information about drug-nutrient interactions is available on this drug-nutrient interaction checker. Aarland RC, Bañuelos-Hernández AE, Fragoso-Serrano M, et al. Studies on phytochemical, antioxidant, anti-inflammatory, hypoglycaemic and antiproliferative activities of Echinacea purpurea and Echinacea angustifolia extracts. Pharm Biol. 2017;55(1):649-56. Chen Y, Fu T, Tao T, et al. Macrophage activating effects of new alkamides from the roots of Echinacea species. J Nat Prod. 2005;68(5):773-6. Cech NB, Kandhi V, Davis JM, et al. Echinacea and its alkylamides: effects on the influenza A-induced secretion of cytokines, chemokines, and PGE₂ from RAW 264.7 macrophage-like cells. Int Immunopharmacol. 2010;10(10):1268-78. Kuang R, Sun Y, Yuan W, Lei L, Zheng X. Protective effects of echinacoside, one of the phenylethanoid glycosides, on H(2)O(2)-induced cytotoxicity in PC12 cells. Planta Med. 2009;75(14):1499-1504. Capek P, Šutovská M, Kocmálová M. Chemical and pharmacological profiles of Echinacea complex. Int J Biol Macromol. 2015;79:388-91. Göllner EM, Gramann JC, Classen B. Antibodies against Yariv’s reagent for immunolocalization of arabinogalactan-proteins in aerial parts of Echinacea purpurea. Planta Med. 2013;79(2):175-80. Rehman J, Dillow JM, Carter SM, et al. Increased production of antigen-specific immunoglobulins G and M following in vivo treatment with the medicinal plants Echinacea angustifolia and Hydrastis canadensis. Immunol Lett. 1999;68(2-3):391-5. Wüstenberg P, Henneicke-von Zepelin HH, Köhler G, Stammwitz U. Efficacy and mode of action of an immunomodulator herbal preparation containing Echinacea, wild indigo, and white cedar. Adv Ther. 1999;16(1):51-70. Hauke W, Köhler G, Henneicke-Von Zepelin HH, Freudenstein J. Esberitox N as supportive therapy when providing standard antibiotic treatment in subjects with a severe bacterial infection (acute exacerbation of chronic bronchitis). A multicentric, prospective, double-blind, placebo-controlled study. Chemotherapy. 2002;48(5):259-66. Naser B, Lund B, Henneicke-von Zepelin HH. A randomized, double-blind, placebo-controlled, clinical dose-response trial of an extract of Baptisia, Echinacea and Thuja for the treatment of patients with common cold. Phytomedicine. 2005;12(10):715-22. Hudson JB. Applications of the phytomedicine Echinacea purpurea (Purple Coneflower) in infectious diseases. J Biomed Biotechnol. 2012;2012:769896. Šutovská M, Capek P, Kazimierová I, et al. Echinacea complex--chemical view and anti-asthmatic profile. J Ethnopharmacol. 2015;175:163-71. Karsch-Völk M, Barrett B, Kiefer D, et al. Echinacea for preventing and treating the common cold. Cochrane Database Syst Rev. 2014;(2):CD000530. Ross SM. Echinacea purpurea: A Proprietary Extract of Echinacea purpurea Is Shown to be Safe and Effective in the Prevention of the Common Cold. Holist Nurs Pract. 2016;30(1):54-7. Ross SM. Echinacea Formula (Echinaforce® Hotdrink): Effects of a Proprietary Echinacea Formula Compared With Oseltamivir in the Early Treatment of Influenza. Holist Nurs Pract. 2016;30(2):122-5. Lee AN, Werth VP. Activation of autoimmunity following use of immunostimulatory herbal supplements. Arch Dermatol. 2004;140(6):723-727. Ardjomand-Woelkart K, Bauer R. Review and Assessment of Medicinal Safety Data of Orally Used Echinacea Preparations. Planta Med. 2016;82(1-2):17-31.